Soundproofing floors is a process that requires a careful evaluation of the current construction and conditions; then the selection of a floor underlay product that will actually work given your specific requirements. There is not a “cookie cutter” product that will work for all floors, or even 25% of the floors to be treated. We consider it our responsibility to make sure you understand how products will work in your project. Products for concrete buildings don’t always work for wood buildings; and there are even buildings where both are present! Your experience with West Coast Sound Solutions should be one where you are provided with relevant information that you can use to make an informed decision, even if our products are not appropriate for your job. As we have done with every solution we offer, we do not settle for average results. We are only interested in products that will produce remarkable soundproofing for your floor. To further explain our approach and experience with floor soundproofing we offer an education section for soundproofing floors. What is the difference in IIC and STC, how are they measured? Understanding how floors transmit noise, and the connection with the ceiling below. This product says STC 71 and IIC 71, and it’s only $ .20 a sqft! How can I improve my existing floor without tearing everything up? What is the difference in IIC and STC, and how are they measured? IIC is the measurement of sound energy blocked by a particular product when used on a tested floor/ceiling assembly. In this case the product is actually tested on a sub floor with an actual floor covering installed. 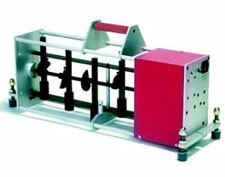 A tapping machine is used to generate a constant impact and sound level on the floor, then the sound energy is measure below. The difference is the Impact Isolation Classification assigned to the material, when tested under that particular floor covering. The most accurate tests show a Delta (Δ) IIC; the additional IIC value that will be provided when the underlay and finished floor are installed on the "specific" floor/ceiling design tested. Remember, most of these test are done on very thick concrete, and that evaluation will not translate in wood construction. STC is a measurement of the reduction in sound energy that a particular product will provide. How much noise will it block? Noise is generated at one end of a very long tube, the product is inserted and the sound levels on the other end are measured. The difference is the Sound Transmission Classification, in decibels, of that product. STC testing in multi level buildings is done to measure the difference in noise energy from one side of the floor to the other. It is very important to get the information in a table format that shows the reading at different frequencies. This STC value is only valuable in the comparison of products, and even then it doesn’t mean a higher rated product will work better in your project. The specific floor/ceiling can vary from one test to another, and this can dramatically affect outcome of the test. Some are done with a ceiling below; some are done without a ceiling at all. Others may have a ceiling with added isolation channels, insulation, etc. As a purchaser it becomes very hard to decide what will happen in your project; we are here to help. 1. How will it work in a floor/ceiling assembly? Or better yet, in your floor/ceiling? 2. When this product is used, what is the performance at the frequencies that matter in your project? Understanding how floors transmit noise, and their connection to the ceiling below. With the many paths shown in the example above, you now have a complete picture of the challenges we face when assisting you to make a decision about floor underlays. Because the ceiling below should be considered in your decision; the existing structure in your project has to be defined before the right product can be selected. This product says STC 71 and IIC 71, and it’s only $.20 a sqft! As mentioned in the preceding section on IIC and STC testing, your project may be much different than the tested floor/ceiling. This inflated data is commonly shown on literature, websites and in showrooms with no clarification. In our industry this is the most common misconception made by the consumer, and leads to much lower than expected results. Please carefully evaluate your current situation, and select a product that is appropriate. See if you can actually get a copy of the test that was done, including a description of the complete floor/ceiling construction tested. Warning: The vast majority of IIC testing is done on 6” or more of concrete. Floor underlay companies test their products for large commercial or multi-family projects, and want to get the highest IIC and STC for their product possible. Performance tested on a 6” concrete slab will never, ever happen if your building is a wood framed floor/ceiling. We can provide unbiased information to help with your selection; we carry a wide variety of products, and have no particular loyalty to one or the other. There are reputable companies that have tested their products in both concrete and wood frame conditions, and do state those values clearly. We may be the ones to explain that the $.20/sqft product you are looking at will not work; and that you may need to spend 5x as much for a product that’s appropriate. We would rather lose the sale and provide you with relevant information than to disappoint you when the product is installed. Just don’t shoot the messenger! How can I improve my floor without tearing everything up? You do have some options to improve your current floor; particularly if you have a floated floor or carpet. Typical projects include a 2nd or 3rd floor Home Theater/Media Room, basement location of the same thing, mother-in-law suite, basement remodel, etc. In many cases the STC (sound blocking) component and the IIC component are both a concern. There are solutions available for one, but maybe not for both issues. Again, your evaluation should be done carefully before selecting a product. Given careful consideration these privacy between floors applications can be solved with one product. If the floor covering can be removed, we can install an appropriate product below. 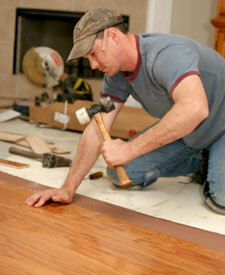 At that time we can also take some steps to address squeaking, popping and movement of the sub floor. Finally, the original floor covering can be installed and reused. Find Your Floor Soundproofing Product. Now that you know a little more about soundproofing your floor, make sure you take a look at the full line of quality floor soundproofing products we offer for floated/glued wood floor, nailed wood floors, carpet floors and tile & stone floors.